Unbeaten Kazakh Gennady Golovkin is persuing an unification bout against newly crowned WBO middleweight champion Billy Joe Saunders. Joe Saunders is reluctant to fight in the USA which is putting the possible fight in jeopardy while IBF are close to order “Tureano Johnson” as mandatory fight for Golovkin’s IBF title just in case Golovkin and Joe Saunders fail to reach an agreement for unification bout. Unbeaten middleweight Gennady Golovkin’s next fight has been confirmed for 23 April 2016 in Madison Square Garden in New York and Billy Joe Saunders is the most likely opponent in what should be a PPV unification bout. Although Billy Joe Saunders camp received a concrete offer from Gennady Golovkin camp the fight is not confirmed as of yet with newly crowned WBO middleweight champion Saunders looking for a bigger chunk that what has been offered in first place. Golovkin on the other hand is likely to be order to fight “Tureano Johnson” who is the mandatory of Golovkin’s IBF middleweight title. So GGG camp is under pressure to put together a decent fight for 23 April 2016. 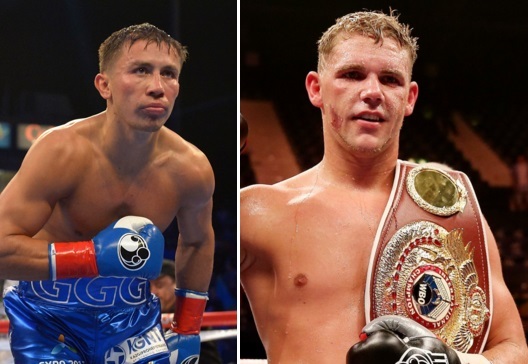 As for the Billy Joe Saunders he is likely to demand a fight in the UK just to not fight Golovkin. is that the dude that ran around while canelo tried to catch him? the dude with no belt? Are you talking about Floyd, canelo tried to catch him too, I get it, you never sow that fight, are you implaying he’s a flatt footer, Canelo?